As promised, here’s the 2nd look from the Winter Edit! 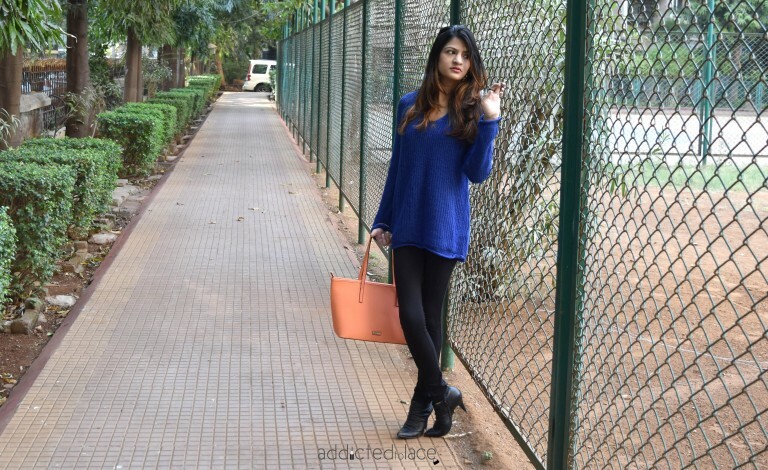 While the previous post was more about keeping it sporty, this one veers more towards the cozy, snuggle-friendly apparel of the season. 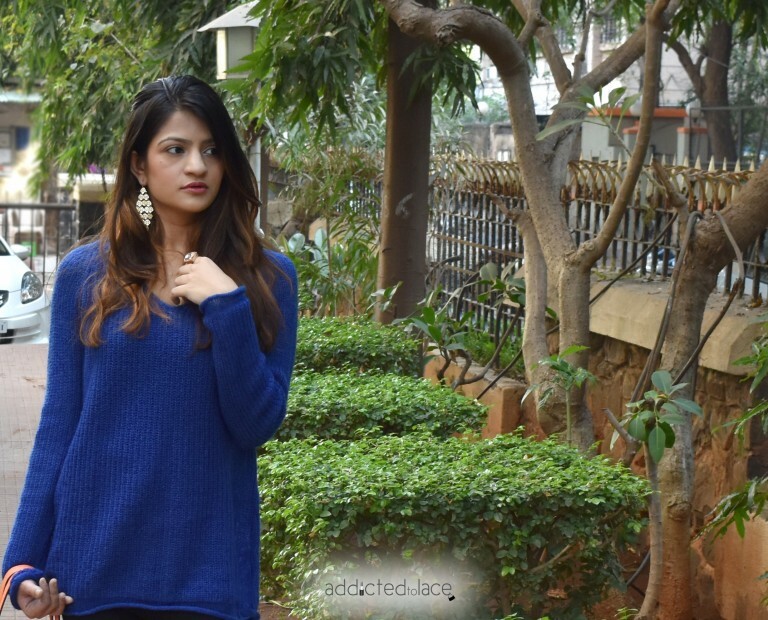 I have always been a fan of soft, slouchy sweaters – they’re comfortable, warm, and exactly what you need when you wish to settle down with a book and a piping hot cup of coffee. But why restrict this beautiful piece of outerwear to the indoors? 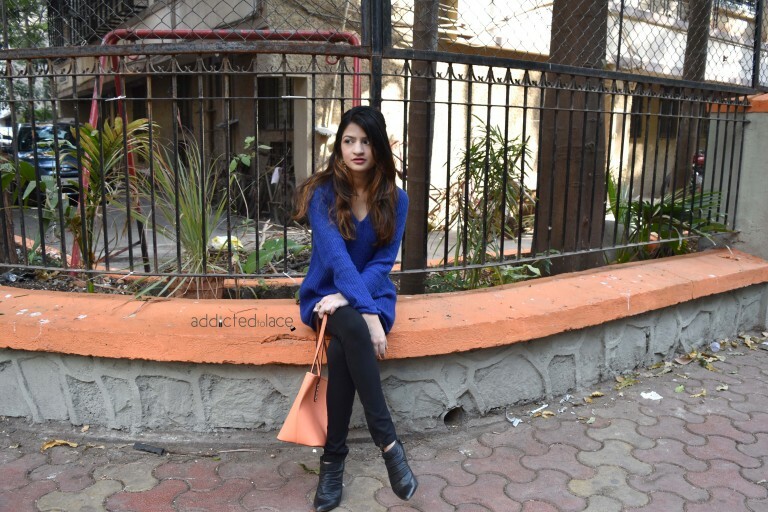 Here, I’ve added a dressy spin to this winter staple from Jabong*! This V Neck Slouch Jumper from Miss Bennett London looks like a light sweater but is actually quite warm! It’s apt for a movie date, a casual dinner with friends, or even for a regular day running errands (in style, of course). 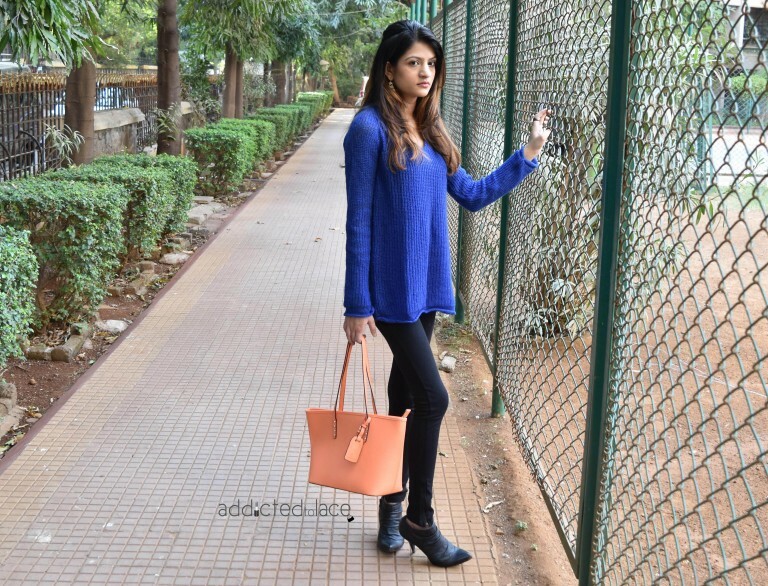 I wore it with a warm pair of leggings, as the loose silhouette looks great paired with skin-fit bottoms. You can even wear it with black faux-leather shorts if you’re looking to add some edge to the outfit! It’s winter so feel free to unleash your faux-leather stiletto ankle boots. 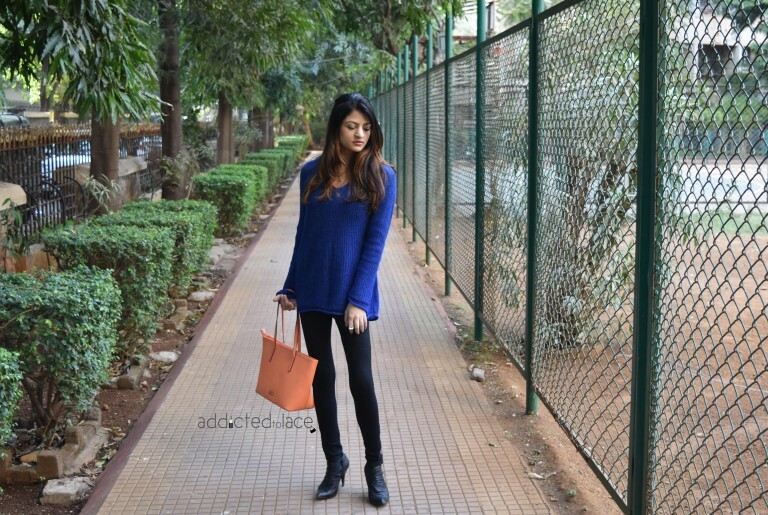 I love donning mine whenever I get the chance, especially since I hardly wear heels on a regular basis (and also because, no one really wears boots in Mumbai *sigh*). 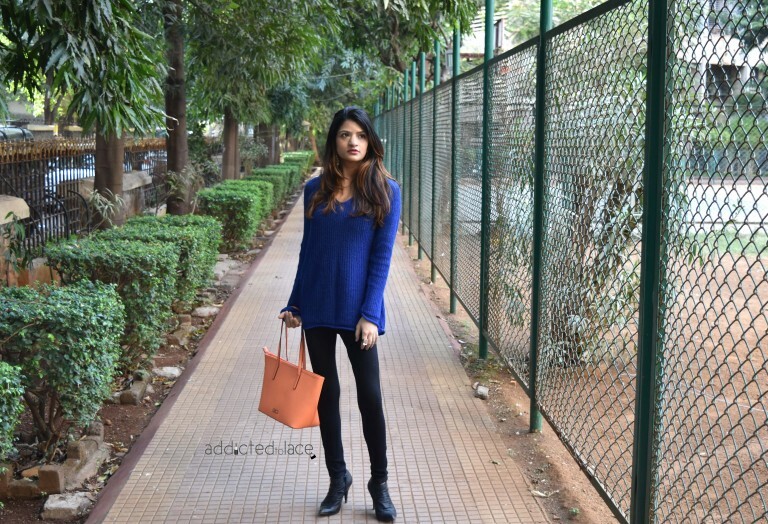 If you’re wearing shorts, opt for a thigh-high pair of boots; suede is all the rage currently! Being a normcore devotee who sticks to monochrome, I hardly ever colour-block. 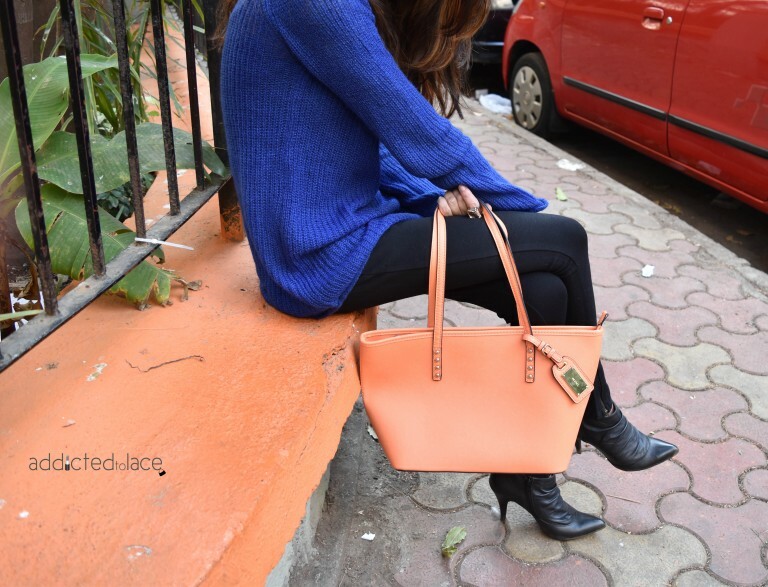 This time, however, I found the perfect opportunity to go down that route with the help of my favourite orange tote! It’s a rather large bag and, I admit, sometimes I hardly have anything stored in it. I just lug it around for show because it’s just that gorgeous (no, but really, it’ll fit your daily planner and iPad together)! From now on, I’m not even going to think twice when pairing orange and blue together. 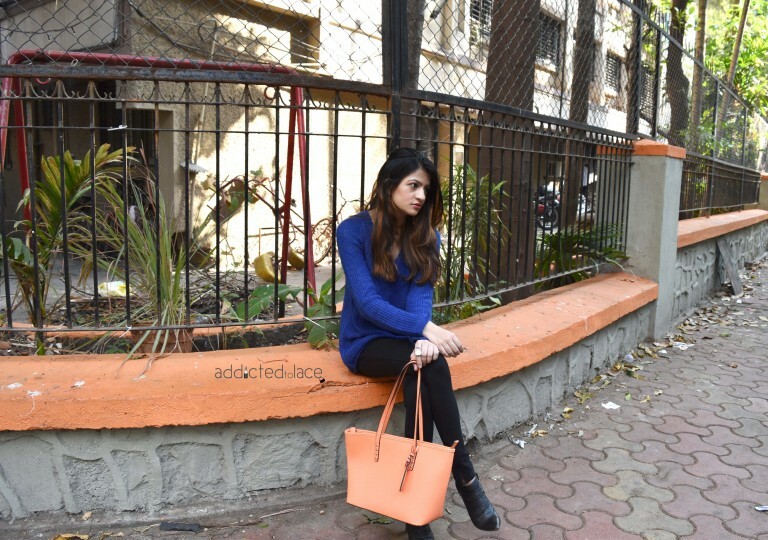 The vibrant blue of the jumper complemented the orange hue of my bag effortlessly! Most people like to match their bags with their shoes, which really is the way to go! For this look though, I wore my black boots to go with the black leggings, hence creating the illusion of a taller figure (obviously, the heels helped with that too). I accessorized with my leaf-shaped gold dangler earrings and a single peach gemstone cocktail ring. Again, the make-up is very simple and natural like the 1st look. 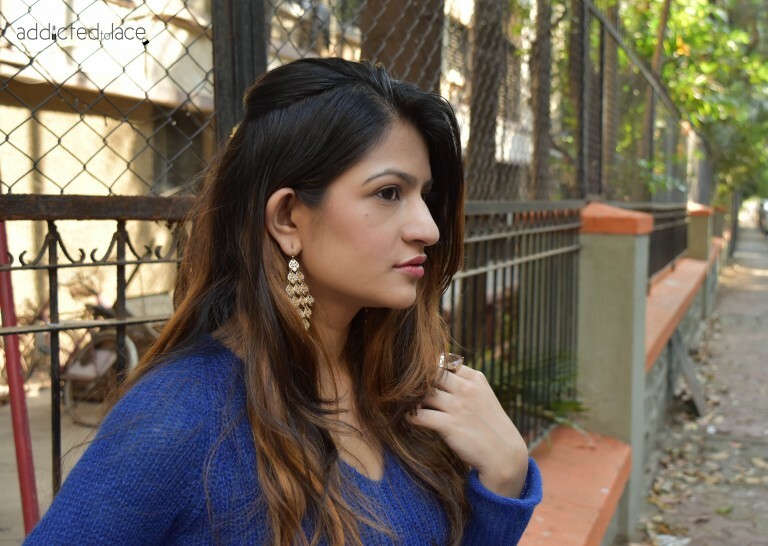 Keeping the cool weather in mind, I added a hint of pink blush to my cheeks, along with a pink shade of lipstick. 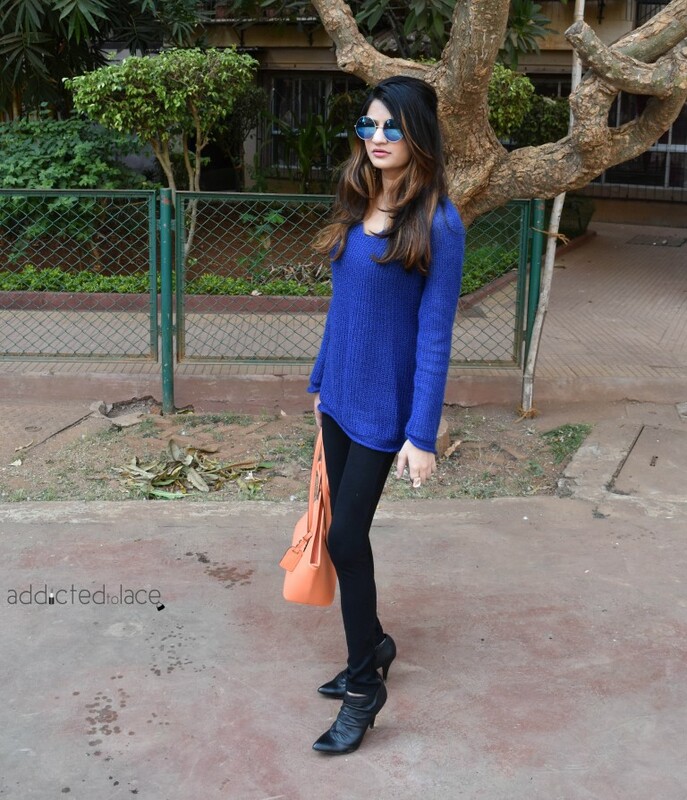 It goes without saying that you shouldn’t leave your house without sunglasses and SPF cream – yes, even in the winters! Hope you all enjoyed the 2-part winter story. Don’t forget to leave your feedback below! 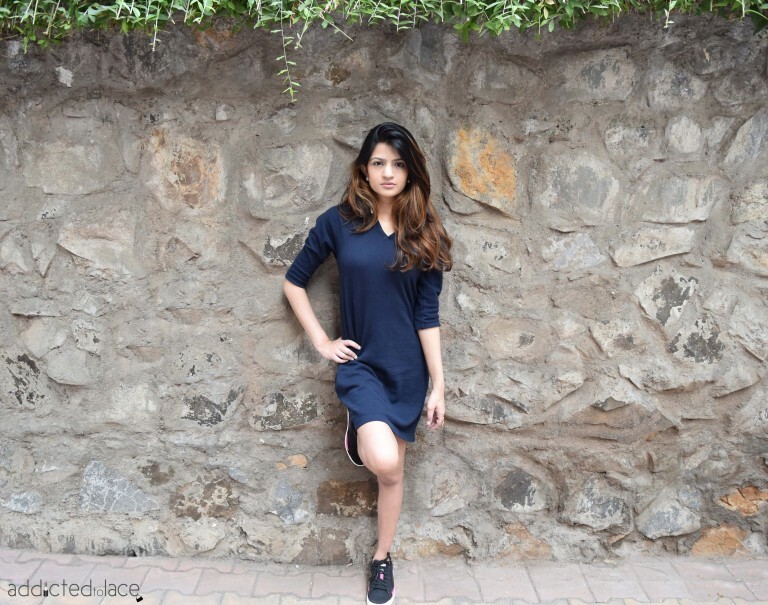 *Jabong provided me a voucher to shop from the Winter Collection, out of which I picked 2 pieces. Hope you checked out the 1st look!